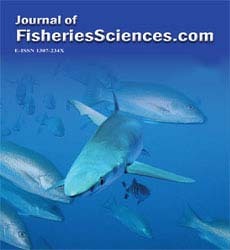 In this study was investigated histological alteration associated with frozen baitfish feeding of cage-reared bluefin tuna (Thunnus thynnus) in the Gulf of Antalya in Turkey. For this purpose, liver, heart and skeletal muscle samples taken from wild (control) and cage-reared bluefin tuna (70 to 150 kg, n = 25) were examined by histologic methods. As a result of in this study was observed vacuolation of the hepatocytes depending on the lipid accumulation in the liver pa-renchyma and lipid deposits in the cardiac and skeletal muscle tissues cells in cage-reared blue-fin tuna. Thus, negative affects of feeding with wet foods have high content of fat and protein in the health of cage-reared bluefin tuna were determined.